Night fishing for bass is an activity that not every fisherman participates in, but it is definitely an activity that every fisherman should try. 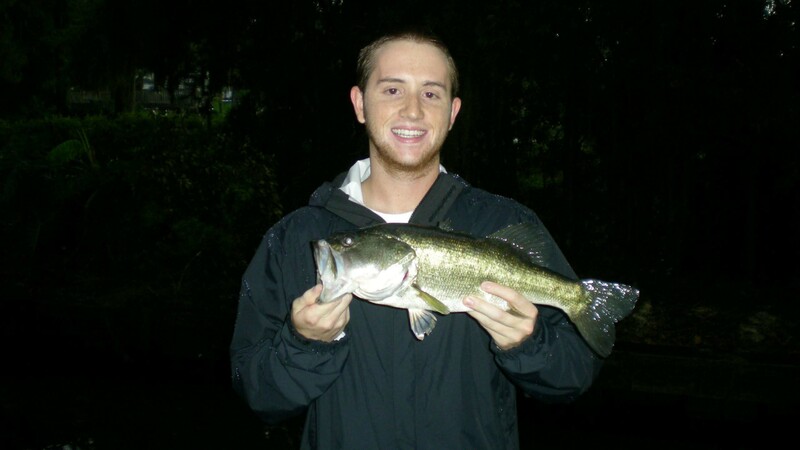 Not only does night fishing offer the appeal of cooler temperatures during a hot Florida summer, it also provides great opportunities to catch large bass that would be otherwise inaccessible or unwilling to feed during the day. The best time to start night fishing is right when the sun sets, get out on the water and start working your lures. However, the main feeding period of bass during summer months tends to be around midnight after the water has had a chance to cool down, that is when you should be ready for some real action. Bass do not feel as threatened at night when they are protected by the darkness, so they move into shallower water and feed more actively. 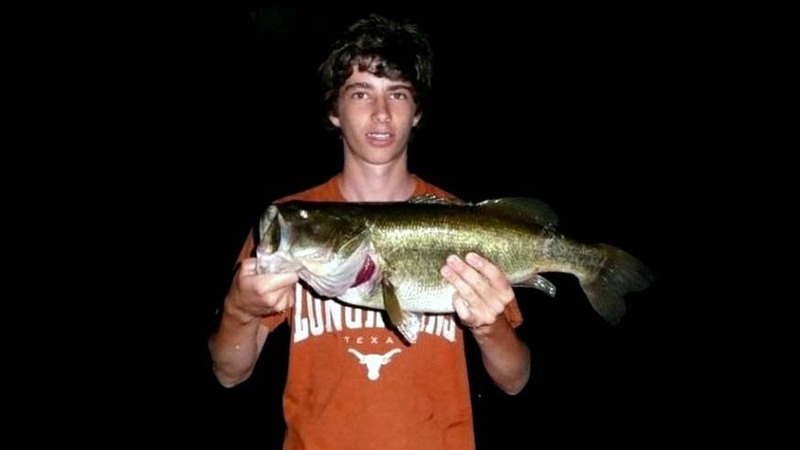 Most usually relate to some type of structure at night because that is where smaller fish and other food tends to be, this makes bass very catch-able. When fishing at night, sound and vibration play a huge role in attracting bass, so the lures we look at will either move a large amount of water, or create unique vibration patterns rather than appeal to the visual elements of a bass. Bass can spot lures that offer contrast against the water rather than normal colors you would use during the day, therefore any dark colored lures will be best for night fishing. If you have spots that are consistent during the day, it is a good idea to try fishing those spots at night as well. 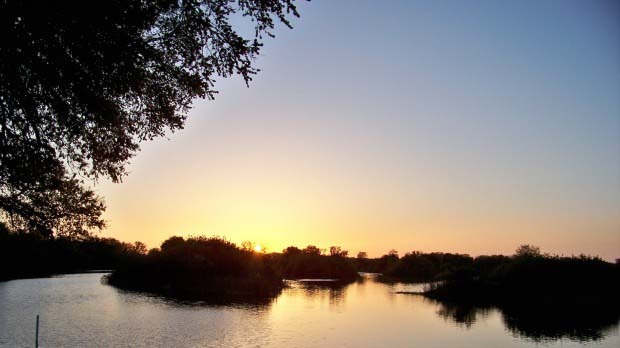 In general, bass will be located in the same areas during the day as they are at night because those areas typically offer the best feeding opportunities or protection. Fishing familiar areas also give you the advantage of having a better feel on your casts and lures in the dark. In addition to usual spots, throwing lures near structure or cover at night can also pay off. Bass usually tend to relate more to a structure at night, especially one that is lighted, typically because there are smaller fish that congregate in these areas and give bass a chance at an easy meal. Casting a jig or spinnerbait near a lighted dock can definitely be key at night. Shallow dark water should not be overlooked either, bass are much more comfortable at night and will venture in to shallow water to find food. Do not hesitate to throw a large worm close to shore in a shallow dark area, especially under overhanging trees. The majority of the large bass I have caught have been in water less than five feet. If the fishing is slow and none of the usual spots are working try using a buzzbait or a spinnerbait to locate the bass, and then switch to a finesse worm or a jig once you have found them. Large Plastic Worms: Without a doubt large plastic worms in the 7’’ to 12’’ range can be incredible for night fishing. The large worm creates disturbances in the water that attracts curious bass. Cast the worm past where you think the bass are so you will not spook them, and then work it slowly toward your intended area. Try all sorts of different action to get some of the big bass to hit these worms. Let them sit on a ridge or in a weed line, and hop, wiggle, swim, etc, to get those hits; but remember, fish it slowly. Try using it Texas rigged or Carolina rigged with a 5/0 hook and possibly a bullet weight. Use dark colors for contrast that the bass can spot, such as black, blue, or purple. A few styles of the large plastic worms are the Kinami Kut Tail Worms, Berkley PowerBait Original Power Worm, Zoom Old Monster Worms, Culprit Original Worm, and Bass Pro Shops Squirmin’ Super Worm. 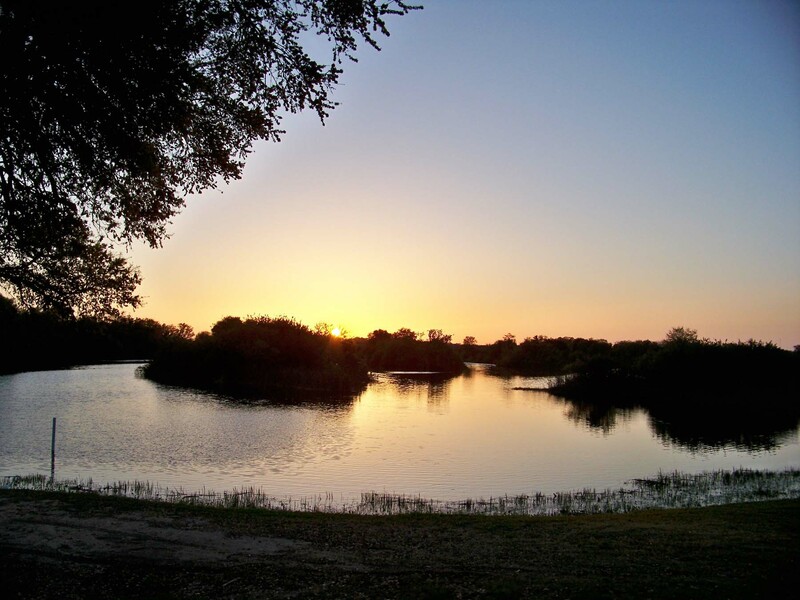 Buzzbaits: The best time to fish a buzzbait is right after the sun goes down, although buzzbaits obviously can make some commotion the still night surface which makes it an easy lure for the bass to find. Generally it is best to work buzzbaits just fast enough to keep them on the surface, however switching up the retrieve of the lure with some erratic motion or prop modification can help generate different sounds for bass. Try to bump it into different areas of cover to make it more erratic and provoke strikes. 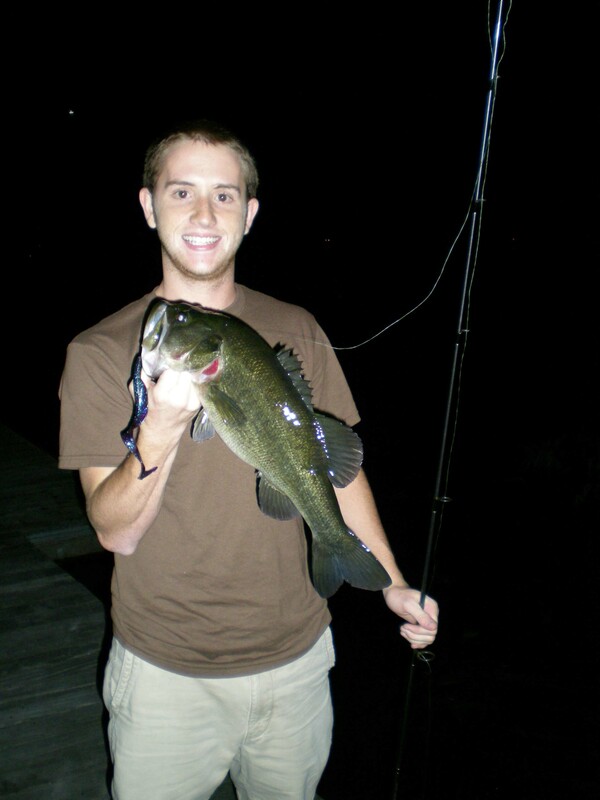 Spinnerbaits: Fishing spinners at night can be very effective due to the vibrations they create that attract bass. An ideal spinnerbait for night fishing is one with large Colorado blades in order to increase the vibrations in the water. 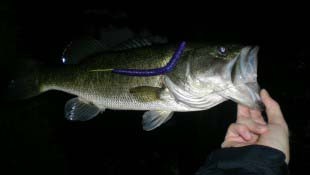 It is best to use dark colored skirts such as black, blue, or purple in order to create better contrast and make the lure more visible to the bass at night. 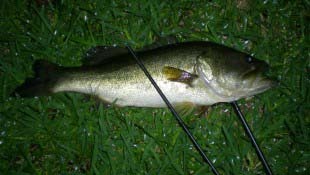 Spinnerbaits can work well on windy nights using a Yo-Yo or Bumping retrieve when topwater lures are not as effective. Always make sure to add a trailing or stinger hook for better hookups on short strikes. Jigs: Fishing a jig and pig at night can work very well for landing large bass. The key is working it very slowly near heavy cover. Try flipping and pitching as well as casting under and around docks and other structures. Jigs typically work well for big bass. A pork or plastic trailer is often added to create more water movement. Topwater Lures: Topwater lures create a large amount of disturbance on the surface and easily attract the attention of bass patrolling the water at night. Poppers and stick baits work well at night. Having a bass explode out of the water in the dead of night will definitely be an experience. Let’s face it, the reason most people use topwater lures is the chance that a bass is going to come blasting out of the water when it hits it, and this can be even more exhilarating at night. A black jitterbug works very well for topwater fishing at night. Creature Baits: Plastic creature baits such as lizards, crayfish, and hawgs move a lot of water and make themselves known to bass at night. Choose a creature bait that best mimics the native food population in the area and work it slowly across the bottom letting it bump into rocks and weeds. They work well Texas rigged to avoid weeds and adding a weight can provide better action, however if you are fishing them around deep structure it is better to use a Carolina rig. Plan on using a sensitive rod for night fishing in order to be able to feel when a bass takes the lure. Also make sure that you have a decent strength line on the spool that can handle large bass. I would recommend using at least 30lb braided line, you do not want the reason you lost your catch to be because your tackle was too light. At night you will be fishing by touch rather than sight so you need every advantage you can get. Using a light and sensitive graphite rod can provide some feeling in the dark. Casting has to be spot on to make sure you know where your lure is going since you can’t see where you are actually casting. Also fighting the bass in the dark can be a difficult transition. Some people use black lights mounted to their boat with fluorescent line in order to be able to see the line on the water which helps with casting and locating the lure. Overall if you get anything from this, remember to use strong tackle and sensitive rods for night fishing. Night Fishing Line – Use something heavier than normal, such as PowerPro 30lb Braid. The fish won’t see the line as well as the would normally so they won’t be spooked, and the extra strength will help you if you over cast into brush or get hung up. This is much more likely when it’s dark and hard to judge distance and objects you’re casting to, trust me. Night Fishing Headlamp – A headlamp is vital for night fishing because it is hands free and ready when you need it. I wouldn’t keep the lamp on all the time, but it sure helps when you have a fish on and can light up the water with a quick button press. I use a Petzl headlamp because they are bright, built well, and the one I have has a red light as well which is perfect for doubling as my hunting headlamp. Night Fishing Life Vest – Avoid anything bulky that will catch on your line when you can’t see it. I would suggest a streamlined auto inflating vest such as the Mustang Survival Auto Activation PFD. It will automatically inflate with air once you hit the water and that will really help if you end up in the dark water and are disoriented. 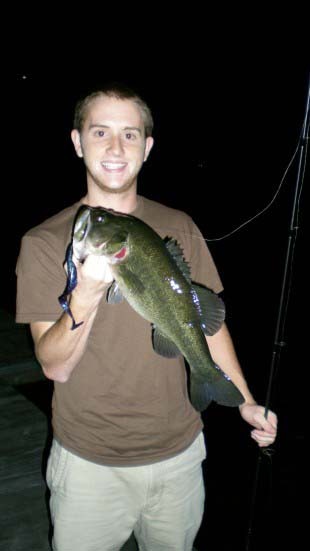 Bass fishing at night is something that every fisherman needs to try at some point. It usually results in better bass fishing in Florida during the hot summer and can even lead to netting some big bass in the double digits. As far as tips go, do not set the hook when you hear a bass break the surface; make sure you actually feel the fish on the line first. At night it may take bass several strikes before it actually connects with the lure so make sure you leave it until you feel it. Try fishing near docks and structure with lights, bass like to wait here to ambush baitfish and other food. Clear lakes at night tend to be best. The best time to night fish in Florida is around April through November. Fighting a bass in the dark is exhilarating, you can’t see what you’re fighting but you can hear everything. Always remember to take proper precautions and have the right gear and safety equipment. 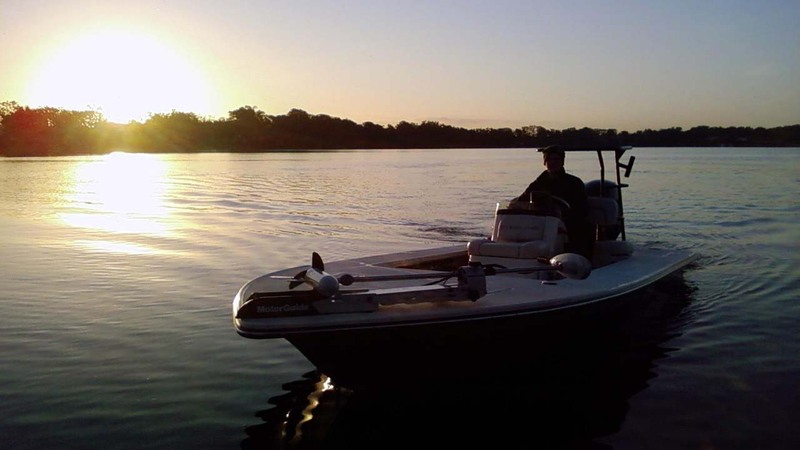 Keep tabs on your location on the lake, especially when fishing on an unfamiliar lake. Idle the boat at night; it gives more time for corrections to prevent accidents. Do not go out fishing without proper boat lights, not only is this dangerous but it is illegal. Wear a life jacket, it may hinder your fishing ability, but it can also save your life.